Automatic personal authentication using biometric information is becoming more essential in applications of public security, access control, forensics, banking, etc. Many kinds of biometric authentication techniques have been developed based on different biometric characteristics. However, most of the physical biometric recognition techniques are based on two dimensional (2D) images, despite the fact that human characteristics are three dimensional (3D) surfaces. Recently, 3D techniques have been applied to biometric applications such as 3D face, 3D palmprint, 3D fingerprint, and 3D ear recognition. 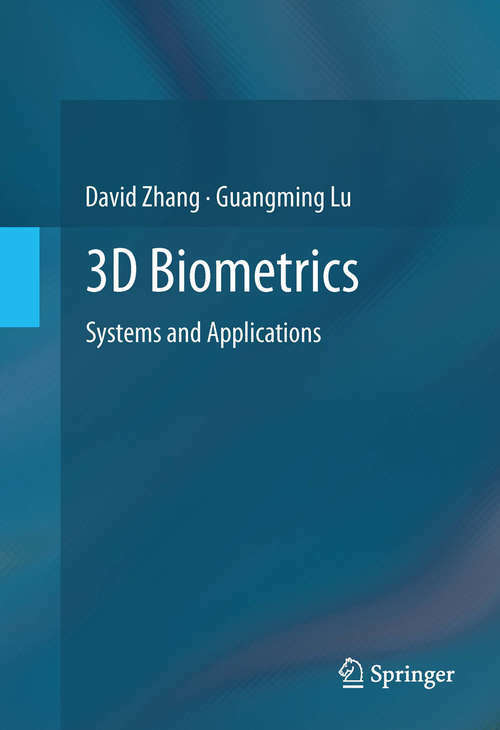 This book introduces four typical 3D imaging methods, and presents some case studies in the field of 3D biometrics. This book also includes many efficient 3D feature extraction, matching, and fusion algorithms. These 3D imaging methods and their applications are given as follows: - Single view imaging with line structured-light: 3D ear identification - Single view imaging with multi-line structured-light: 3D palmprint authentication - Single view imaging using only 3D camera: 3D hand verification - Multi-view imaging: 3D fingerprint recognition 3D Biometrics: Systems and Applications is a comprehensive introduction to both theoretical issues and practical implementation in 3D biometric authentication. It will serve as a textbook or as a useful reference for graduate students and researchers in the fields of computer science, electrical engineering, systems science, and information technology. Researchers and practitioners in industry and R&D laboratories working on security system design, biometrics, immigration, law enforcement, control, and pattern recognition will also find much of interest in this book.